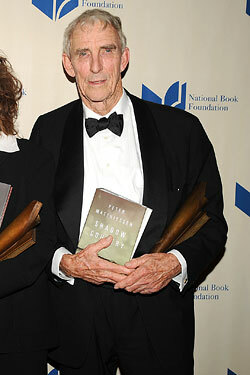 Peter Matthiessen, NBA winner for fiction. It was maybe not a good year to move to Wall Street, but the National Book Awards were long overdue for a change of venue from midtown’s land of beige, the Marriott Marquis — which, as Josh Ferris told us, “looks like the place where your cousin got married.” So there we were, Cipriani Wall Street, a gold-flecked, domed neoclassical vortex with 70-foot ceilings in the bowels of an old bank. There were hunks of Parmesan in bowls all over the place. Anna Wintour and Candace Bushnell were there, along with a few bona fide fashion disasters (a brocaded apron, a sort of unitard). What was this, the Oscars? Hope and change, then, were in the air, desperate circumstances notwithstanding here on Wall Street and up in publishers’ offices. But would the award selections bear out this trend? Annette Gordon-Reed, for The Hemingses of Monticello, became the first African-American woman ever to win for nonfiction. Another barrier broken. Grove founder Barney Rossett, 86, finally got his due for taking on the book censors in the sixties, getting a lifetime-achievement-type award, and told the crowd Obama’s election allowed him to hold on to his American passport. For fiction — if you want to be brutally superficial about it — Aleksander Hemon, the young buck writer of The Lazarus Project, was the change nominee, while Marilynne Robinson and her quiet sequel Home would be more of the same. Naturally, you’d expect it to be Hemon’s year, but the winner was … Peter Matthiessen, whose Shadow Country wasn’t even a new novel, really, but “a distillation of three old overwritten books,” as one publisher put it — an odd and controversial selection even as a nominee, and an even stranger winner (the crowd reaction was far from unadulterated cheering). Matthiessen, 81, confessed he hadn’t prepared a speech, not expecting the win: “I’d been creeping around the walls looking for the exit” when his name was called, he said at the podium.